You're probably wondering why I'm posting an apple crisp recipe in the middle of Spring. Well, you know the last few months have been super busy and I haven't been regular with the posts here. Today, I have a little time on my hands and was looking through some of the pictures I've taken of posts I'm hoping to get done soon and this one jumped out. I realized I hadn't shared this recipe with you yet and I thought it would be a good opportunity to do that. You see, like I've said in the past, I have been cooking and baking, I just haven't gotten around to posting yet. I know while we're enjoying the slight warming of the weather, most of you are in the middle of autumn / fall and you should have plentiful access to some apples. Now, I've had my share of apple cobblers and pies before, but this little dessert is in a league of its own. 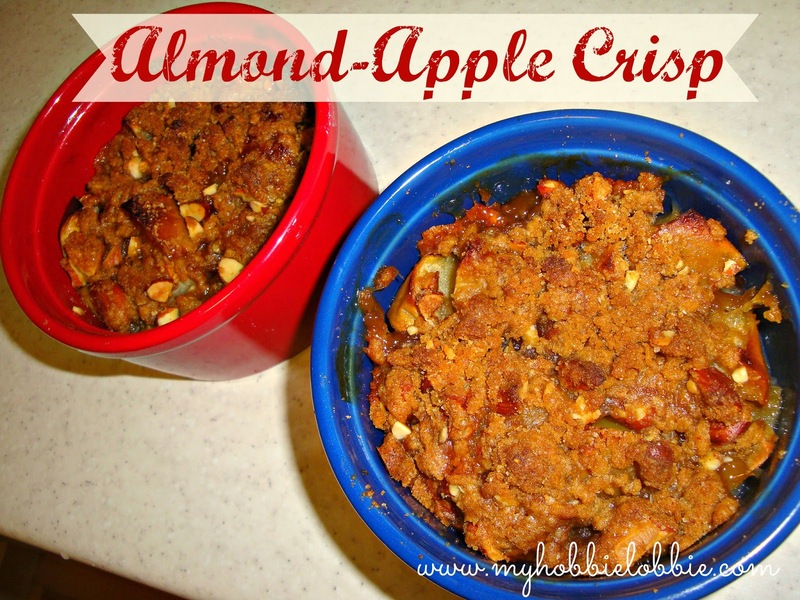 The crisp almond topping adds a whole new dimension to the apple-cinnamon mix. Its adds some crunch and pairs with the apples so well, you have to eat it to believe it. In the picture, I've only captured the crisp, but you could serve it up with some vanilla custard or some lovely vanilla bean ice cream. The only thing I did differently, is I left the skin on the apples. But if you don't like it, you could peel them. Oh yeah, I also left out the nutmeg. This recipe is a sure keeper. I see myself making this over and over again. Stir the cornstarch and the lemon juice in a large bowl till it dissolves. Add the apples, sugar, salt and cinnamon and toss well to combine. Pour the mix into and 8" square baking dish. I did that and had some left over so I used a couple of ramekins. Rub the butter into this mix, by using your fingers till it resembles coarse crumbs. Sprinkle the topping evenly over the apple mix. Bake for 50-55 minutes or until the topping is golden brown.